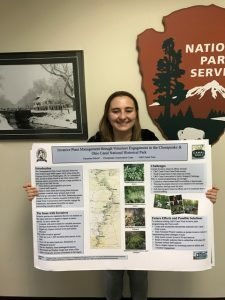 Cheyenne Sebold, the Trust’s Programs and Partnerships intern, recently presented a poster at the Chesapeake Conservation Corps’ annual Chesapeake Watershed Form focusing on volunteer based invasive plant programming to manage invasive species in the C&O Canal National Historical Park. The C&O Canal National Historical Park (NHP) is home to a diverse array of native plants and animals, but invasive plant species threaten native life found in the Park. Invasive species are organisms that are not endemic to the region and have a negative impact on native species. These plant species can compete with natives for valuable resources and decrease the diversity of native organisms. Due to the Park covering three distinct regions in the state of Maryland, the limited staff capacity, and the varying physical structure of the C&O Canal NHP, invasive species are able to thrive, putting native life at risk. Through the help of volunteers, many projects are able to get completed in the Park that would otherwise go untouched. Current volunteer programming allows for some invasive species management, but increased efforts are needed to better manage the invasive species population. By enhancing current volunteer programs, the C&O Canal Trust would protect native species in the Park, engage the community, and educate the public on issues surrounding nonnative species. Future efforts may include incorporating educational materials into Canal Pride events and training Volunteer Project Leaders on proper invasive plant removal. Informative materials would teach volunteers proper invasive identification and removal methods, provide an educational experience on why invasive species are a threat to the Park, and reach a broader volunteer audience that may want to get involved but is unfamiliar with invasive plants. Training Volunteer Project Leaders in proper invasive plant removal would increase the available staff to lead events, therefore increasing the impact on invasives in the Park.